This easy crochet baby blanket is inspired by doing double crochets in the gap spaces between the double crochets in the row below. Inspired by our Trendy Baby Blanket. This is a very similar design but without changing the colours. This afghan has 2 rounds of single crochet in white. This baby blanket uses two colours. Baby Rose, main colour, is the primary colour shown in my project is discontinued, sorry I had this in my collection and didn’t realize it was discontinued. The border is white. To get this complete size, you will need 4 balls of main colour and 1 ball for a border. 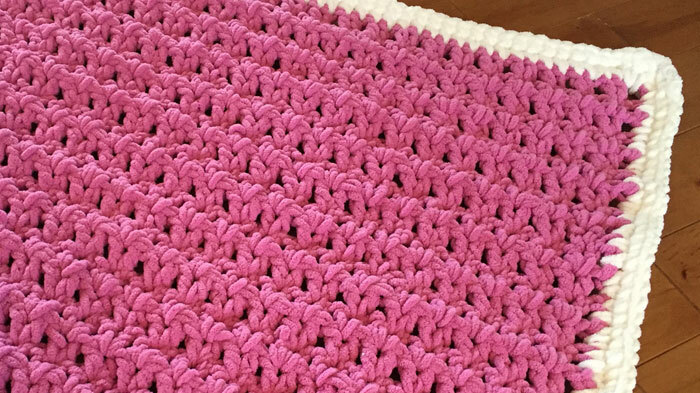 Using 10 mm or Size N crochet hook, you will get a 44″ wide by 48″ long baby blanket. Using Main Colour, chain 78. DC twice in 4th chain from hook. *skip 1 stitch, 2 dc into next stitch (this forms a group of 2). Repeat * until end. 1 dc in the final chain. Turn. Ch 3, skip the next dc and dc twice into the space between the next group of 2. See picture for clarification. * Dc twice in each space between the groups of 2 from the row below. Repeat * until the end. 1 dc in the final stitch. Turn. By going between the groups of 2, it causes the stitches to have a zig zag appearance. Repeat Step 2 until you run out of 4 balls of Main Colour. Continue to repeat Steps 2 – 3 until your afghan is 36″ long. You will run out of yarn by the end. Fasten on to any corner. 1 sc evenly spaced down the outside edges. In corners, place 3 sc. On top and bottom edges 1 sc into each stitch across. Slip stitch to first sc. Ch 1, 1 sc in first sc, 3 sc into next. *1 sc into each all the way to the next corner. 3 sc into middle of the 3 sc in the row below. Repeat * around and then join with a slip stitch to the beginning and fasten off.